Are you looking for a super inexpensive, easy, and quick way to create a beautiful pet-inspired gift? If so, you are at the right place! 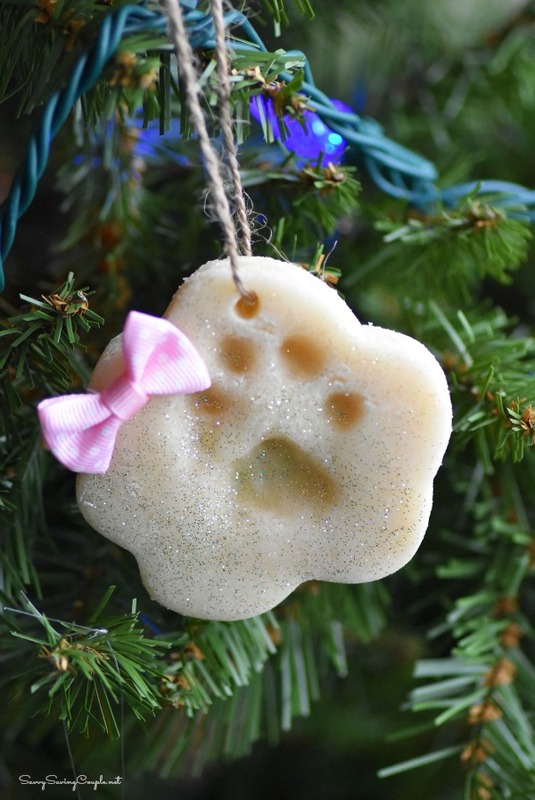 Today’s craft features DIY Paw Print Salt Dough Ornaments that are sure to make your recipients smile! After all, the joys of Christmas and the holidays are for all family members-right? Each year, my mother in law always makes sure she checks off all her grandchildren from her shopping list. This includes her three fur granddaughters too! My little Chiweenie, Beasley is one of the lucky three and typically get a stocking or treat bag filled with her favorite Purina brands of snacks, and little toys. This year, I thought it would be cute to give a little something special back to my family members who love our dog, and make some keepsake ornaments for our family tree. 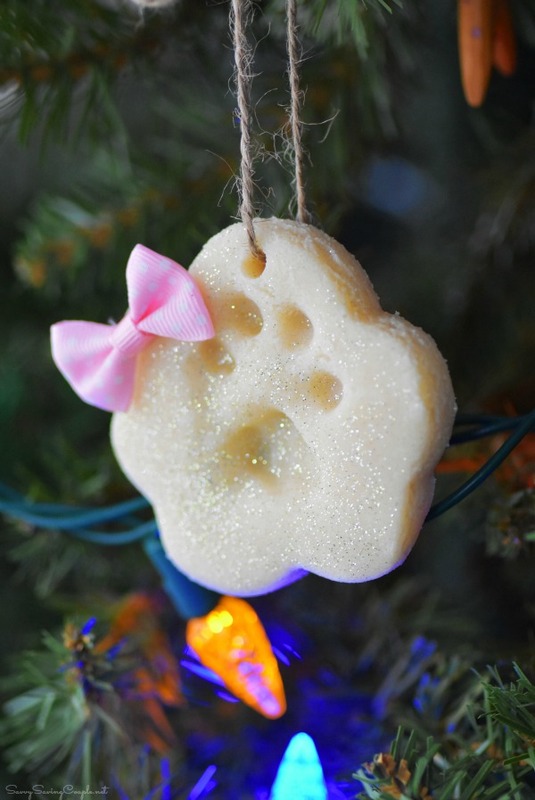 I was inspired to make these DIY Paw Print Salt Dough Ornaments after visiting the Pet Park by Purina. They always have such great savings, and DIYs for every season. This year is no exception with their money-saving coupons, free stencils, printable pet gift tags, and two DIY gift ideas. Since my dogs loves Beggin Strips, and Beneful Baked Delights Heartfuls I printed my coupons, a set of pet gift tags and was inspired to make our paw print ornaments. Maybe I lived under a rock, but I had no idea it was so easy to make salt dough ornaments–literally just salt and dough!? 1/3 cup of water *use less/more until the dough reaches a pliable consistency, and forms a non-sticky ball. Using paw print, and holiday shaped cookie cutters, carefully cut out your shapes and place them on your baking sheet. To get my dog’s little print, I lured her over with some Beneful Baked Delights Heartfuls and carefully pressed just her paw pad into each shape. I did not force it in or her nails would have also been imprinted. Bake for 10-15 minutes (depending on final thickness) until the ornaments are firm. Once they are cooled, string them, and add any additional embellishes you wish. I glued mine on with white glue, but hot glue should work too! 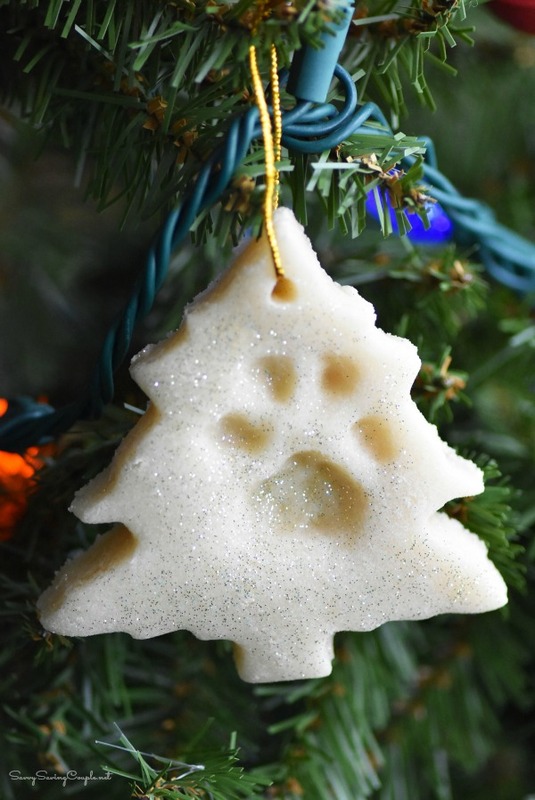 To gift your DIY Paw Print Salt Dough Ornaments wrap them in tissue paper, add a printable pet gift tag, and place them under the tree until Christmas! Be sure to keep salt dough away from pets as it can be hazardous! Those ornaments look great. I’ve got to do this with my two dogs. I might have to trim up their fur a bit first, though. What a cute idea for a home made ornament! This is the perfect thing for any dog owner. This is an adorable idea- I am going to make these with the ‘kids’ this weekend! I haven’t made salt dough in years. I love this! I have so many pet’s I’d love to do little paw prints of this is adorable, and I’d keep them forever! We have always enjoyed getting little gift for our dogs. They get to dig through all the gifts to find the gifts. I think this is just a precious idea! I am making my daughter do this with her pups. This is such a great idea to keep pets involved in the holidays. My dogs have such big paws, we’d have to do one paw ornaments. Oh that is just too cute! I’d love to make some ornaments with our cat’s paw prints! We love making DIY ornaments every year too! The kids would have so much fun making this with Mr. Cooper for our tree. 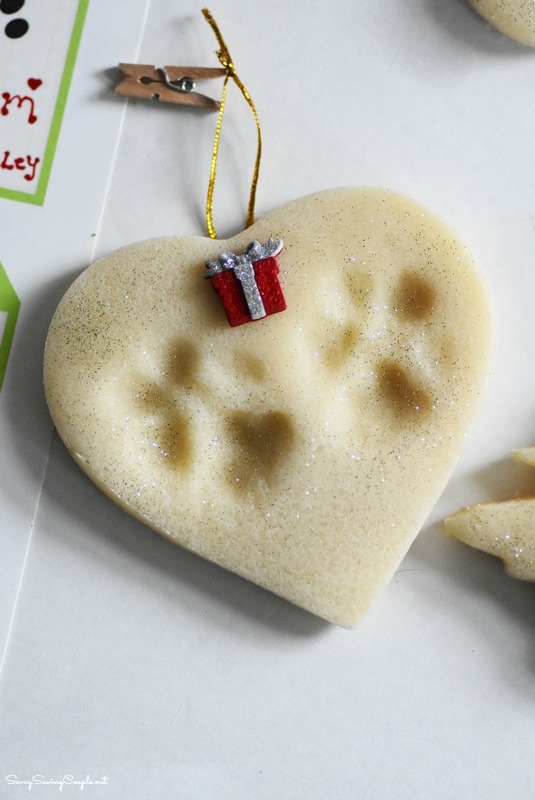 This is a fantastic ornament idea/.. My parents would love an ornament of the furbabies paws. These are adorable ornaments to make with your pet!! Great coupons too, lots of great savings. These are just darling. I wonder if I can get my cat to cooperate with me… hehe. I love these paw prints ornaments. They’re so cute and memorable. 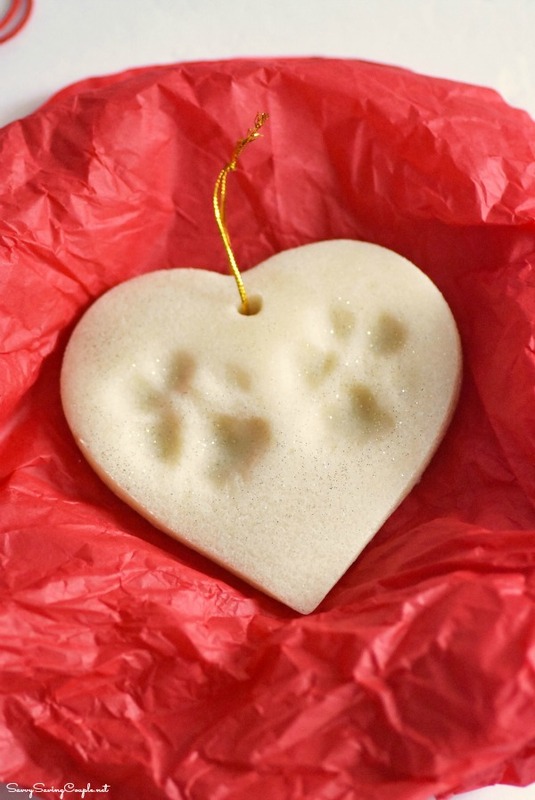 What a fun, DIY ornament to make for the most important member of the family: your pet. Your idea goes to prove that family heirlooms aren’t just for humans. I love making salt dough ornaments! They’re such a great crafty way to create your own ornaments!